Some interesting, some informative, some inspiring and some odd, here are 42.195 marathon facts. 1. ‘Marathon’ comes from the legend of Pheidippides who is said to have run from the city of Marathon to Athens to give word about the Greek victory over the Persians in 490 BC. After delivering his message, it’s said Pheidippides collapsed and died. 2. At the first modern Olympic Games in Athens in 1896, 17 competitors ran the 24.8 miles (40K) from Marathon Bridge to the Olympic stadium. 3. The Boston marathon is the world's oldest annual marathon, first run in 1897. 4. Marathons of around 25 miles continued until the London Olympics in 1908. The intended length was 26 miles, starting at Windsor Castle and finishing at White City Stadium, however Queen Alexander requested a 385 yard extension to the East Lawn so the royal children could watch the runners passing. The new 26.2 mile distance became the official standard for all marathon competitions in 1924. 5. Oprah finished the Marine Corps marathon in 1994 in 4 hours, 29 minutes. After finishing, Winfrey said, although making it through was “better than winning an Emmy,” she had no desire to ever run another marathon. 6. One of the more unusual marathons is the Midnight Sun marathon held in Tromsø, Norway where runners compete under a night time sun. 7. The North Pole marathon holds the Guinness World Record for the northernmost marathon, with competitors running in punishing conditions and temperatures of minus 30 degrees Celsius. 8. Model Christy Turlington completed the 2011 New York City marathon in four hours, 20 minutes and 47 seconds. 9. As the last runner in the London marathon passes, the blue paint marking out the course is steam-cleaned off so the streets can return to pristine condition as quickly as possible. 10. In 2003, Sean Combs set out to ‘beat Oprah’ in the New York City marathon. He finished in 4 hours, 14 minutes, 54 seconds. 11. The New York City marathon, held annually on the first Sunday in November began in 1970 with 127 runners who paid an entry fee of $1 to run several loops through Central Park. Only 55 finished. In 2013 non US competitors will pay $347 to participate. 12. Melbourne hosted its first marathon in 1978 on a course that began in Frankston and finished outside the Melbourne Town hall. 13. The women's marathon was introduced at the 1984 Los Angeles Olympics and was won by Joan Benoit of the United States in a time of 2 hours 24 minutes and 52 seconds. 14. The Walt Disney World marathon course runs through Epcot, Magic Kingdom Park, Animal Kingdom Park, and Disney’s Hollywood Studios. 15. After serving as campaign advisor for his father’s unlucky presidential run in 1992, President George W. Bush ran the Houston marathon in 1993 in 3 hours, 44 minutes. 16. Competitors run 5,164 steps along the famous wall during the Great Wall marathon in China. 17. Kenyan runner Patrick Makau Musyoki holds the current world record marathon time with a completed time of 2:03:38 set at the 2011 Berlin marathon. 18. British runner Paula Radcliffe holds the women’s record for fastest marathon which she set at the 2003 London marathon with a time of 2:15:25. 19. Before the introduction of a minimum age requirement of 18 for North American races, 8-year-old Wesley Paul set the record for youngest marathon runner in the United States when he finished the New York City marathon in 1977 in three hours, 37 seconds. 20. Will Ferrell completed the Boston marathon in 2003 in 3 hours, 56 minutes, 12 seconds. 21. As the youngest marathoner in the world, Indian slum orphan Budhia Singh had run 48 marathons before he turned five years old under the direction of his trainer, Biranchi Das. 22. Aged six, Wu Chun-hao completed the Fubon Taipei marathon in Taiwan in December 2010, running the race with his five siblings. 23. Fauja Singh is the oldest man to complete a marathon, aged 100, in Toronto in 2011. Nicknamed the ‘Turbaned Tornado’, he finished in eight hours 11 minutes and six seconds. 24. The Melbourne marathon’s oldest competitor is Anthony Martin who completed the 2011 event aged 83 in a time of 6:40.15. 25. Katie Holmes finished the 2007 New York City marathon in 5 hours, 29 minutes, 58 seconds. 26. Despite suffering a heart attack and undergoing a double heart bypass four months before, British adventurer Sir Ranulph Fiennes completed seven marathons on seven continents in seven days in 2003. 27. Charity fundraiser Lloyd Scott completed the 2002 London marathon wearing a 110 lb deep-sea diving suit. It took him five days and eight hours, breaking the world record for the slowest marathon time. His suit is now on display at the National Maritime Museum. 28. Edward Norton ran the 2009 New York City marathon in a time of three hours, forty eight minutes and one second. 29. In 2011 football freestyler John Farnworth completed the London marathon in 12 hours and 15 minutes, juggling a football for the entire distance. He didn't drop the ball once. 30. On September 15, 2009, comedian Eddie Izzard, at the age of 47, completed his 43rd marathon in 51 days, completing his final marathon in 5 hours and 30 seconds. 31. At the 2010 London marathon 100Ibs of Vaseline, 200 bottles of baby oil and 2000 plasters were available to runners. 32. There are over 550 marathons held in the U.S. annually. 33. The largest marathon in the world is the New York City marathon with over 37,000+ finishers. 35. In 2006 actor Freddie Prinze Junior completed the Los Angeles marathon in 5 hours, 50 minutes and 49 seconds. 36. Melbourne marathon course records for male and female events were set in the same year, 2010, when event conditions were cool and windless. Ethiopian runner Mulu Seboka ran 2:32.20 and Kenyan Japhet Kipjorir ran 2:11.04. 37. Nicknamed the ‘Czech Express’, Emil Zatopek won the 5,000m, 10,000m and the marathon gold medals at the Helsinki Olympics in 1952, the only athlete ever to have achieved this feat. 38. At the 1904 St Louis Olympic marathon, competitor Fred Lorz hitched a lift for 11 miles after suffering stomach cramps, then jumped out and ran into the stadium to be crowned the winner. Lorz was later disqualified and banned for life, however the ban was lifted when he claimed it was a joke. 39. The first black African to win an Olympic gold medal was the Ethiopian athlete Abebe Bikila, who won the marathon in Rome in 1960. Much to the dismay of shoe sponsors Adidas, Bikila ran the race barefoot. 40. Celebrity chef Gordon Ramsey finished the 2010 Los Angeles marathon in three hours and thirty six minutes. 41. In 2011, Belgian runner Stefan Engels ran a marathon every day for a year, covering a total distance of 15,401 kilometres. .195 The motto for the 2013 Medibank Melbourne Marathon is 'anything is possible'! 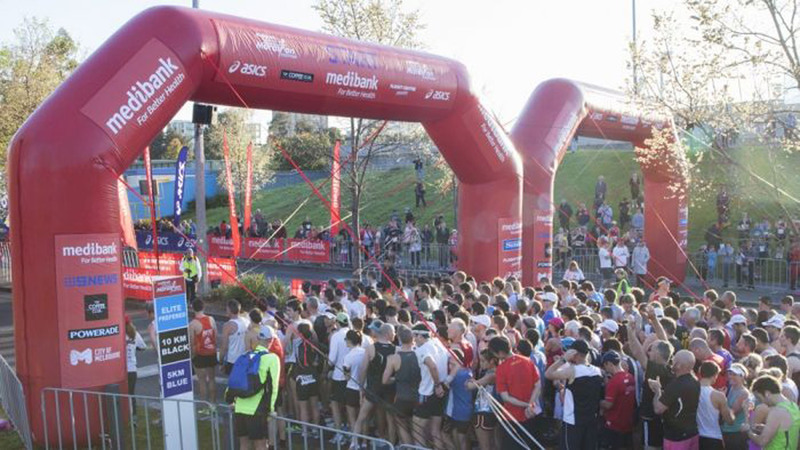 For more information or to register for the 2013 Medibank Melbourne Marathon click here!